Bye bye Android, enter the Verizon iPhone. 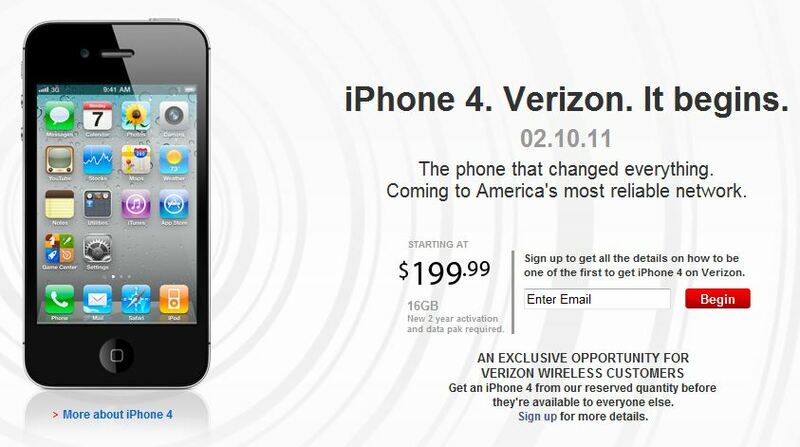 It finally happened, starting February 11th Verizon will start selling the iPhone on their CDMA network. I’ll get to more of the specs later, but for now I want to talk about what this means for the rest of cellular world, mainly for Google’s Android. Over the past couple of months, when the rumor mills really started turning, lots of polls started popping up about how people felt about a Verizon iPhone. The resounding conclusion was that most smart phone users would switch to the iPhone if it was offered on Verizon. Now I know, the Android OS (and all of its iterations) recently took the top spot of the most widely used mobile OS, and rightly so, the market has been flooded with Google’s pet project. This is why Android has the most to lose from today’s announcement. If most smart phone owners will switch and Android is currently the most used, then a large percentage of those making the change would currently have Android devices. So how did Google fall into this trap (possibly imagined by Apple all along)? Carriers such as Verizon, Sprint, etc. really had no inner competition, it was just a matter of which device manufacturer to go with rather than which OS. This false win was also perpetuated by the tendency of cellular users choosing to not get an iPhone simply because it was on AT&T, further isolating the market. This created two separate markets. One where the iPhone reigned supreme, and the other where no competition really even existed. But with the Verizon iPhone in play it becomes one market again where Google has everything to lose and Apple everything to gain. So my prediction is that within two years (long enough for anyone just purchasing a smartphone’s contract to be up) we’ll see a drastic drop in Android powered devices and a huge uptick in iOS market share. But enough about all of that, lets talk about the new (well kind of) hotness. iPhone, Verizon edition is pretty much a cloned copy from AT&T but with two fairly important differences. The first is something I’ve been talking about for years, CDMA’s issue with data and voice at the same time. Well it just can’t do it, and the Verizon iPhone is no exception. For some (maybe most) people this isn’t a big deal, but for me it’s not helpful. I like the ability to be at Lowe’s talking to someone on the phone while checking the pricing at HomeDepot. Maybe it’s just me, but since the data portion of my iPhone is what I use most, anything limiting when and how I use it is a big deal for me. The other difference is the new Verizon version can be used as a mobile wifi hotspot allowing up to 5 other devices to connect to it. Very cool, considering that it took how long for tethering to come out and then AT&T not even let you use it? Other than those differences there haven’t been any other changes. Also, it doesn’t look like Verizon will be cramming any of its own software (Vcast, Navigation, etc.) onto the iPhone, like they are known to do. This could be because Apple won’t let them, but either way, it’s a good thing. Pricing you ask? Doesn’t look like we have any plan prices yet, but we do know the 16GB version will be $199 followed by the 32GB at $299, both with 2 year agreement. The mobile hotspot option will most likely cost you a little extra a month as well. So in the end, I don’t see a jump to Verizon in my near future, but I’m excited to watch the huge flow of customers to America’s largest network to get the world’s best phone. Well that, and watching Apple’s stock price continue to go up. UPDATE: Verizon announcement could be as soon as next week to steal the afterglow of CES11. Stay tuned. For the longest time I would laugh at anyone who would udder that phrase. It was ridiculous. Apple touted features that would only work on AT&T’s network in their ads and would have to eat crow to lauch on Verizon. Well, it would appear that I need to change my tune. The vague unreliable rumors have now moved on to more credible sources and Verizon looks poised (Network speaking) to prove them true. February looks to be the month of much rejoicing for many people around the country. But hold on, don’t go spending that Christmas bonus just yet. Here are some things to think about first. LTE – This is Verizon’s answer to “4G”. Chances are if the iPhone launches on Verizon it will come with this highly coveted notation. An iPhone on a high bandwidth wide area wireless network = awesome, but will you get those speeds at your house, don’t hold your breath. Just as Sprint is piggy backing off Clearwire’s WiMax network, LTE won’t be available in all markets. Verizon’s site says that it will be available nationwide by 2013, so you non city dwellers might want to wait. Pricing – I know I’m fortunate. I was grandfathered in when I bought my iPhone 4 as I had been with AT&T with my iPhone 3G for close to 2 years, so I’m still holding on to the unlimited data plan. The way things seem to be looking, cellular companies are trying to do away with these types of plans, and possibly even charge you different amounts for different types of data. There also seems to be issues with the limited plans AT&T has been giving out to its new iPhone customers with mysterious data transmissions taking them over their limit. So I’m hesitant to jump the AT&T ship and lose my unlimited plan. Who knows how much Verizon will charge for iPhone data, so we’ll have to wait and see. Sudden influx in traffic – Everyone and their mother (if she knows how to use it) will want to jump to the Verizon iPhone. Will Verizon have the same issues that AT&T initialy did with data speed because of the new subscribers? Only time can tell. Those are my thoughts on the subject so far, I give no recommendations. What I do recommend is buy your Apple stock now if you haven’t already. A Verizon iPhone launch will make Apple the king of smartphones for sure and the stock price can only go up because of it. Now, there’s something you can do with that Christmas bonus.